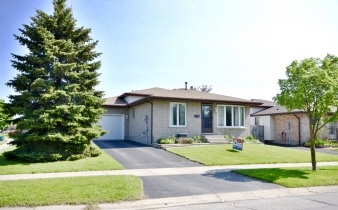 Sparkling 4-Level Back Split with attached garage that offers many options. Would be ideal for a large extended family, in-law suite or rent out the lower level to a college student. Main Level features large Living Room highlighted by a gorgeous bay window. Bright sun-splashed Kitchen includes 3 appliances and separate Eating Area. Also features 3 spacious Bedrooms which includes a 2-piece Master en-suite. Don't forget the large 4-piece Bath as well! The third and forth Levels are fully finished with a separate entrance & features a fabulous Family Room warmed by an electric fireplace, large Bedroom and gleaming 3-piece Bath. Lower Level includes white Kitchen cabinetry & a possible 2nd Bedroom with some minor changes. There is also an over-sized 1 car garage with garage door opener, main door to private fully fenced real yard, a refreshing above ground pool and more.